The Hooligan Tool is one of the world´s most popular forcible entry tools. These heavy-duty tools were designed to pound, puncture, pry, twist, and cut all types of barriers encountered by emergency service personnel. Rescue Products offers you the most versatile line of hooligan type tools anywhere. We have expanded our line of Hooligan Tools to include Highway Hooligan Tools, Tactical Hooligan Tools, Lightweight Hooligan Tools, and Spark Resistant Hooligan Tools. The Kelly Tool is often used in a wedge & sledge combination with a flat head axe. Now specified by fire services that want a rugged forcible entry tool without the protruding point found on the Hooligan type tools. Both the wedge end and claw are drop forged from from high alloy steel and heat treated for maximum strength. The wedge and claw have been machine sharpened for easy access to a prying point. 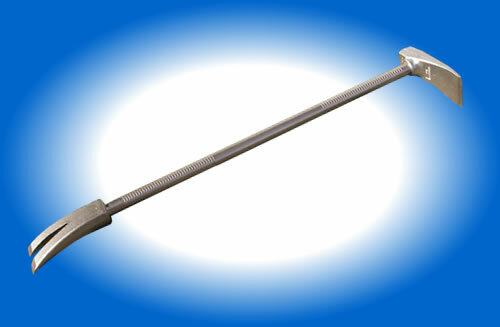 Both ends are permanently press fitted to a 1” (2.5 cm) stress proof steel bar with machine grooved hand grips. The wedge end extends into a protruding hammer head to be used as a striking tool or receive hammer blows. 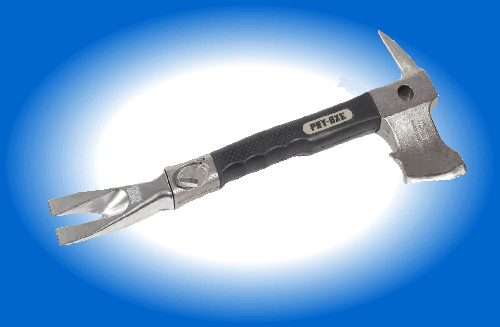 The tool features a gently curved claw for maximum prying leverage and has a recessed nail puller. This parallel claw is slotted to slip over locks and hasps. The Biel Tool is another Rescue Products hand tool that is designed to be used to assist in personal entry and escape. Weighing only 3.3 pounds, the Biel Tool is lightweight enough to be carried in the pocket of your coat or on your belt. This small axe can also be extended to a length of 19 inches if additional leverage is needed. Just press a button and the tool will extend or retract to meet your needs. Here is a tool that has withstood the test of time. For over 30 years the Pry Axe® has remained the best selling tool in our line. The Pry Axe is being used by fire, police and rescue services worldwide. The Pry Axe is a lightweight, multi-purpose, slam and ram tool designed to pry , enlarge openings, cut sheet metal and twist off locks and latches. The Pry Axe is small enough to carry and rugged enough for most jobs. The Pry Axe head and claw assemblies are separate sections forged from high alloy steel and heat treated for maximum strength. A solid steel shaft is press fitted and pinned to the claw. A tubular steel handle is press fitted and welded to the head. A rubber sleeve over the handle provides a non-slip grip. The tool weighs 6.6 lbs (3 kg) and is 18” (45 cm) closed and 28” (70 cm) extended. The Pry Axe is chrome plated for good looks and easy maintenance. The PRT is a powerful hand held rescue tool that can be put to work with a minimal amount of training. Primarily designed for fast, forcible entry and penetration, one person can quickly pry open locks and doors in seconds and easily break through brick and concrete block walls with a few minutes. The Slam and Ram action of the PRT directs all of its force directly at the point of impact - without deflection, making it safer and more effective than a sledge and wedge. This heavy duty rescue tool is easily stored and transported , so it can always be the first tool to the rescue, until heavier, powered equipment can be employed, if necessary. The PRT is a powerful hand held rescue tool that can be put to work with a minimal amount of training. Primarily designed for fast, forcible entry and penetration, one person can quickly pry open locks and doors in seconds and easily break through brick and concrete block walls with a few minutes. Bull Point - 18.3 in (46.5cm) long tool bit for breaking concrete and masonry materials. 5 in thick unreinforced concrete is easily broken after only 6-8 strokes of the ram bar. 1 in Chisel Tip - 18.3 in (46.5cm) long tool bit, also used for breaking concrete, prying and breaking bolts, breaching brick and block walls. Lock Breaker Claw - 12.4 in (31.5 cm) long tool bit for prying or forcing open doors, windows, twisting hasps and breaking locks. Metal Cutting Claw - 12.4 in (31.5 cm) long tool bit for punching and cutting sheet metal (automobile roofs and bonets, aircraft, structures etc). Works like a manual can opener. Wide Chisel Tip - 18.3 in(46.6 cm) long tool bit for lifting, prying and punching metal. 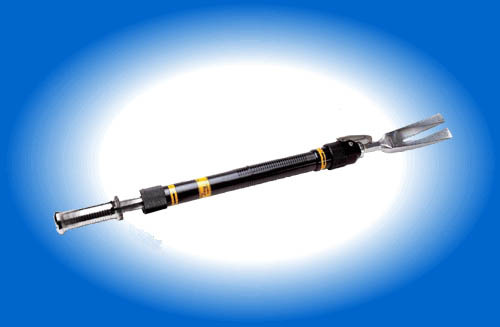 Provides extra length for reaching into narrow crevices and pry bar leverage up to 53 in when fully extended.